From $ 494 $ 444AUD per night We have direct contracts with most villa owners. We don't add any booking fees. We are 100% transparent with no nasty surprises. 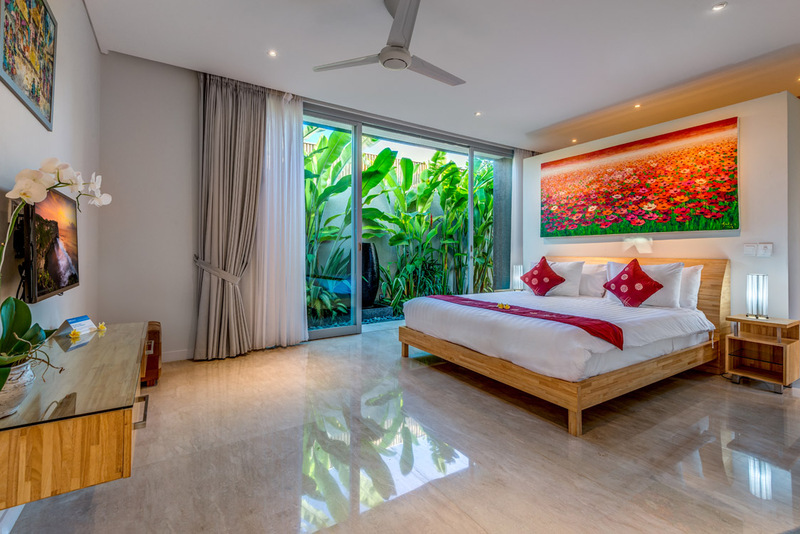 Villa Indah is a modern 3 bedroom Seminyak holiday villa rental situated in the safe confines of the Aramanis villa estate in a fabulous Seminyak location so you can easily walk to great restaurants, cafes, boutiques, spas and even the beach. The Bintang Supermarket is nearby with everything you will need including ATM’s, fresh produce, snacks to take back to the villa, alcohol, fruit and veggies and imported items. The villa complex is professionally managed so your every need will be taken care of at Villa Indah. The outdoor setting is the perfect blend of modern architecture and traditional Balinese elements amid lush tropical gardens. The ironwood timber deck stretches the length of the villa as do the crystal clear waters of your private pool. At one end, a traditional bale surrounded by lush tropical plants is perfect to cozy up with a good book or just relax as you watch the kids playing in the pool. Bask in the tropical sun on the lounges as your holiday tan starts to take hold and you shift into holiday mode. The villas smart design with floor to ceiling glass panels allows you to enjoy tropical living or reside in air-conditioned comfort. At one end of the living area is a modern kitchen and timber dining table for 8 guests, the perfect spot for casual dining or a fancy dinner party. The smart design allows for an outdoor lounge by the pool, recessed into the pavilion, it is a great alfresco entertaining area. At the end of the pavilion is the media lounge where you can sit in air-conditioned comfort in front of the large flat-screen on the stylish leather sofa. 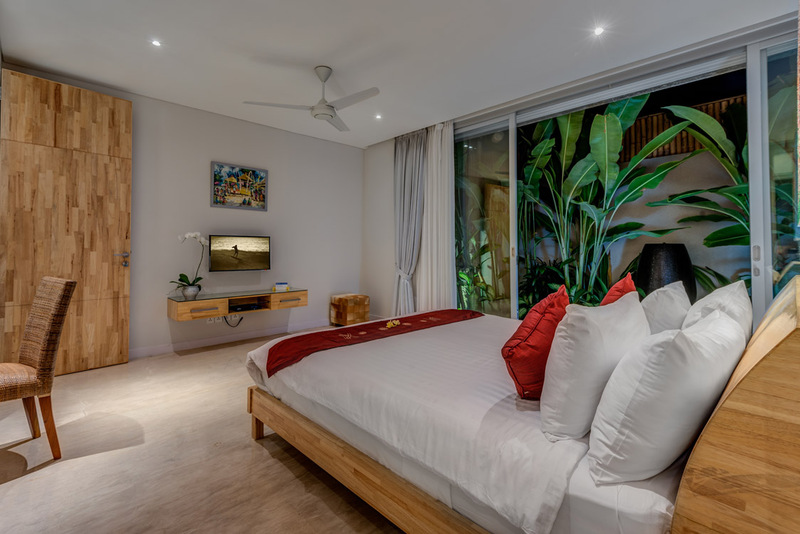 The bedrooms are elegant modern sleeping spaces, vibrant artworks busy the walls while two of the rooms feature queen size beds and the third a larger king size bed. 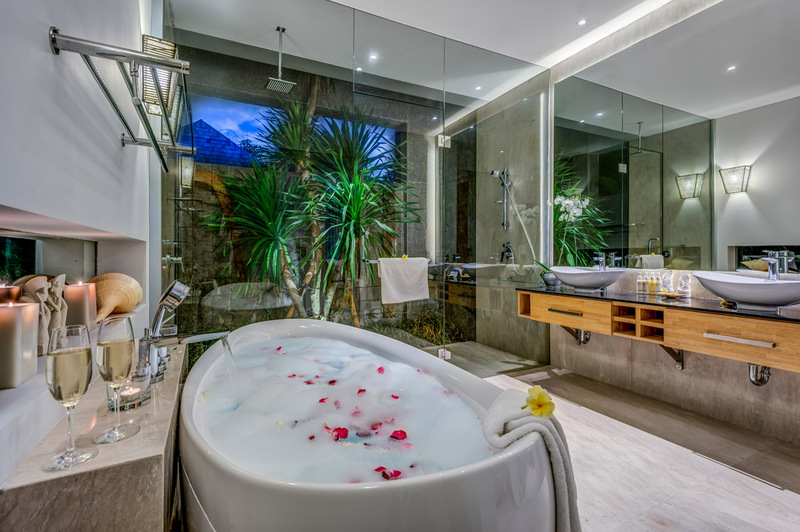 The rooms feature large en-suites with private tropical gardens, with luxurious soaking tubs and rain showers in the private gardens. The complex management team provide the Balinese staff with a high standard of professional training so your guaranteed to be well looked after during your stay. The complex is operated like a boutique five-star hotel with concierge desk, room service and personalised butler and chef services. The Villa is located just off Jalan Raya Seminyak where you will find Bintang supermarket and access directly on to the beach along Jalan Camplung Tanduk where you will find relaxed dining at Lucky Day and fine dining right on the beach front at Gado-Gado with a great wine list & kids menu. Head left along the beach and enjoy the sunset on a beanbag on the sand at the very popular La Plancha at Double Six beach. This is the place to be at sunset time. Enjoy the amazing atmosphere here . The Cocoon Beach Club has a pool with daytime menus as well as fine dining, fresh oysters one of the specialties. If your coming to Bali with the kids you will not find a better villa in terms of location, amenities and value for money! Make sure you take the kids to Waterbom Park for a fun day out. If you love shopping then the famous Jalan Kayu Aya or Eat Street is nearby where there are loads of shops, cafes and restaurants to take the family. If you can’t go without your coffee fix then Revolver & Cornerhouse cafe are a must visit. For a real treat visit the iconic Ku De Ta & Potato Head beach clubs. And for a dining experience you can’t go past La Lucciola which serves the best Italian food on Petitenget Beach, all close to the villa. 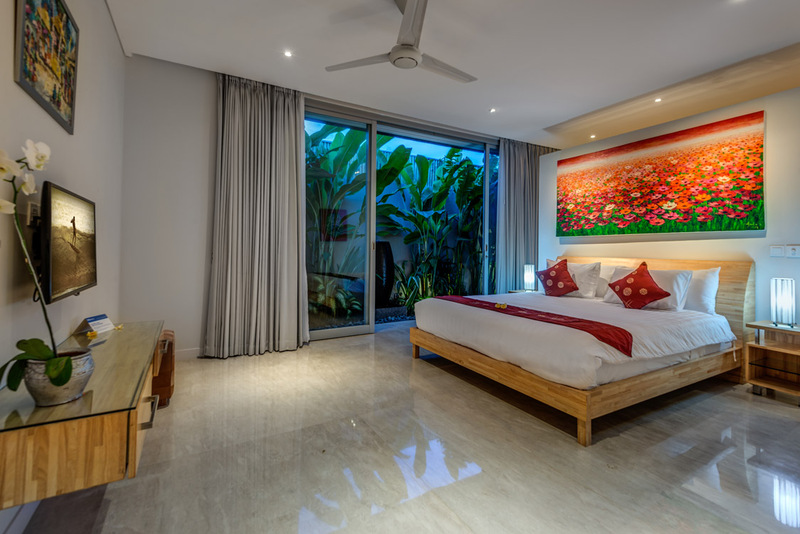 Book your Seminyak holiday at Villa Indah well in advance as this is a popular villa, especially if your planning a trip to Bali during the Australian school or public holidays. We stayed at this villa for 7 days over the school holidays with our 2 young children and everything was perfect. Loved the location which was really close to absolutely everything in Seminyak (Sisterfields, Seminyak Village, Drifter surf etc). The staff were fabulous and made us feel right at home from the moment we arrived. The rooms were spacious, very modern and all meticulously maintained by the villa villa staff. Cannot rate this highly enough. If you are going to Bali with a family we recommend this villa. 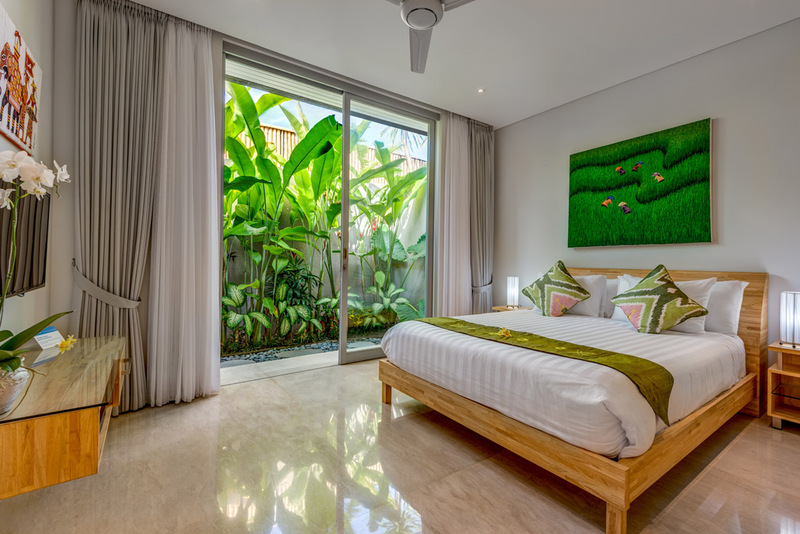 We wanted a villa that was close to everything in Seminyak and Villa Indah was exactly what we were after. The design was perfect and we loved the fact that it was spacious so we could have our own privacy and space. It was peaceful, quiet and the staff were very attentive and always there to see that we were taken care of. We did arrive late and they were all there to greet us with a welcome drink. This level of professional service continued through out our stay. Overall this was a great decision and we will be back next year...hopefully:) Thanks to Dewi and Ina at Bali Villa Escapes for organising this for us. This easily gets a 10 out of 10 for the location, value for money and experience. Absolutely perfect for our family - loved the place as soon as we saw it and it only continued to get better. As regular travellers to Bali from Singapore we are always on the look out for a top villa and Indah is it. An amazing and very central location is exactly what we wanted. Plus the villa staff with their helpful service is an added treat. Highly recommend this for anyone who is looking for a tremendous villa. Modern, clean where we instantly felt as though we were coming home. A wonderful tropical ambiance for our family of 6. First time staying in a villa so we were a tiny bit apprehensive about what to expect. Let me tell you there was nothing to worry about. We were greeted with warm, smiling happy faces every day by the staff and the positive energy of this villa kept all of us in great holiday spirits. Forget hotels, the villa experience has changed my perception of how our family will travel in the future. I love the privacy and the attention we got. We were so fortunate ( there were 5 of us) to have stayed at Indah villa for 9 days - and I have to say that I only wanted to stay longer. Gorgeous open plan atmosphere with wonderful staff. Waking up every morning was a real pleasure and to be served breakfast by the pool was a real treat. We have never had this level of service or luxury before. We are planning to return sometime next year & highly recommend Aramanis Indah villa to anyone wanting a fabulous holiday villa close to all the best things in Seminyak. Thanks to everyone at Villa Indah at Aramanis for one of the best holidays ever. Your kindness and warm smiles are what really made this place so unforgettable. My children constantly talk about the pool and all the fun times. Thanks again and we will be back.